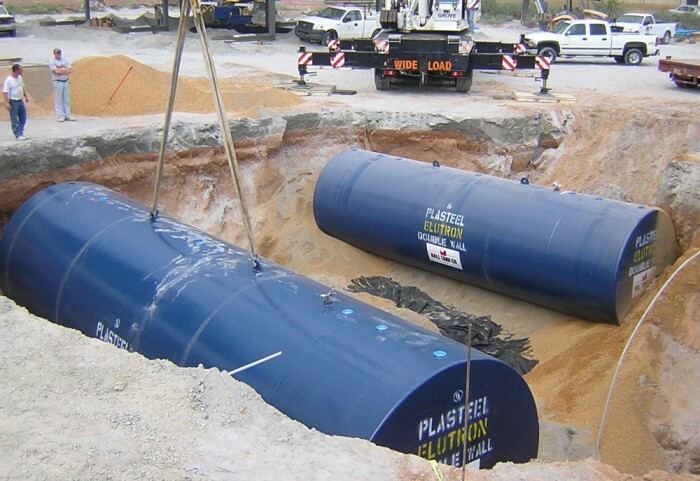 The Plasteel® FRP jacket encapsulates the steel primary tank providing a UL Listed and Tested exterior corrosion protection system for the Plasteel Double Wall Elutron® jacketed Tank. The inner primary steel tank is assembled, welded, and tested for tightness. The primary steel tank provides the underground structural performance for the Plasteel Double-Wall Elutron Jacketed Tank. The stand-off material and outer fiberglass reinforced plastic (FRP) secondary containment jacket are applied 360 degrees around the inner primary tank and the tank heads, creating an interstitial space. The interstitial space between the primary tank and the secondary containment jacket is designed to provide access to detect a liquid in the interstitial space and containment of the liquid. The Plasteel Double Wall Elutron jacketed Tank has been UL performance tested per UL Standard 58, External Pressure Test (EPT), Paragraph 18. There has never been a documented external corrosion failure of any Plasteel Tank. Capacities up to 40,000 gallons.